Visual Tools Make Debt Management EasierEliminate The Muda! When starting your fight against debt, it can be overwhelming. For many years I remained in denial, not wanting to face the impossible task of addressing the problem. While it remained hidden from view, the problems only had a tendency to grow larger. When the day came that we decided to get it under control we missed some great tools and techniques that would have certainly made our challenges easier to grasp. Some of the best tools are those that bring visual attention to your efforts. As an example some people establish saving or spending jars that let you see how much money you are accumulating (or spending). Dave Ramsey advocates using envelopes to manage spending. If you are really determined to get the debt under control another technique that can be very motivating is to display your objective publicly. I don’t mean that you need to display your debt on the internet, though many personal finance bloggers got started by doing just that. What I mean is setting up a large chart on the wall in your house. Use the chart to get everyone at home involved and working together for the common good. List each debt in a graph, similar to the blood drives in school. As you pay off more of each debt, color in the appropriate amount. This same technique is used in performance oriented work environments. A sales floor for example will often list each sales person on a chart and track their sales. It is not uncommon to see 10%-15% increases in performance by simply making performance visible. Imagine getting your debt paid off 10%-15% faster! If you are more suited to using your computer to track your debt reduction efforts there are many great programs available, some for free. To date I have not tried them but I have heard great reviews of Mint.com as an example. If you are a fan of Excel there are a number of free spreadsheets that are available as well. One of my favorite sources for financial spreadsheets is Vertex42. For Debt Reduction this spreadsheet is very comprehensive. Not only can you list all your debts but it does the calculations for you to see how much you are paying in interest, how long it will take to pay off all your debt and which you should pay off first. You have the choice of the two methods of debt reduction strategy I wrote about with my Financial Principle #3. A) You can select the “Snowball” method paying your lowest balance first and working your way up. This gives a psychological boost. B) You can select the “Avalanche” method attacking your highest interest rate debts first. This nets the lowest total interest payments. 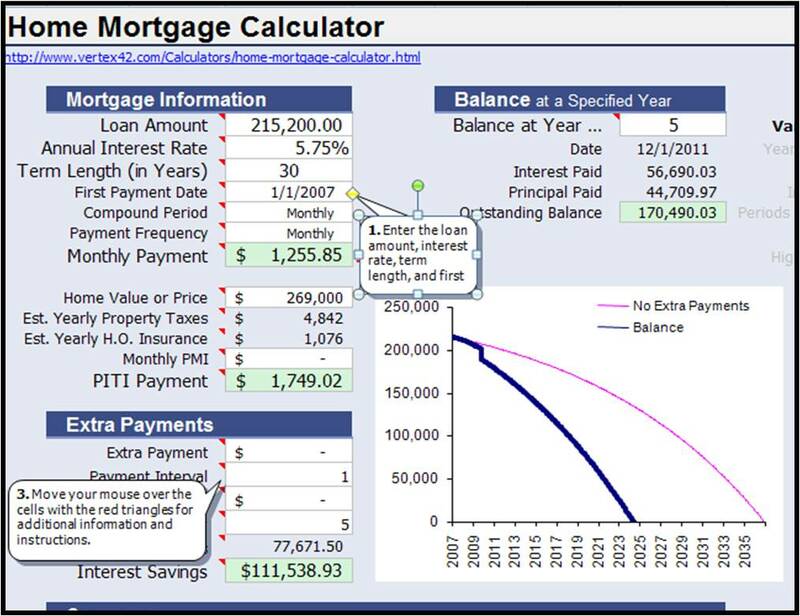 Another great tool they have is a Mortgage Calculator (pictured above). With this spreadsheet you can enter not only your normal payments but you can play with scenarios of paying off your mortgage early. It’s not only great to see the impact of adding another $100 each month to the principal but it also is motivational and makes you want to find even more. Vertex 42 also has a number of other Excel based spreadsheets. If you are past the stage of debt reduction be sure to check out their other Financial Calculators including a 401K Calculator, a Savings Interest Calculator, and even a College Savings Calculator for little Johnny or Jane. There are many great techniques people have to make their spending and saving habits more visible and more effective. Our other readers would appreciate if you would share your ideas by leaving a comment below.